How about this unique addition for your event. Whether you are looking for something slightly different for your wedding reception, or maybe a large corporate event. Or just after something extra special for your birthday party. 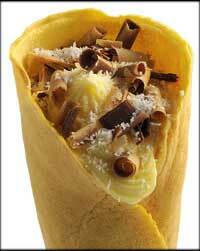 For all kebab lovers who also love chocolate! Looking for an alternative to a chocolate fountain?! 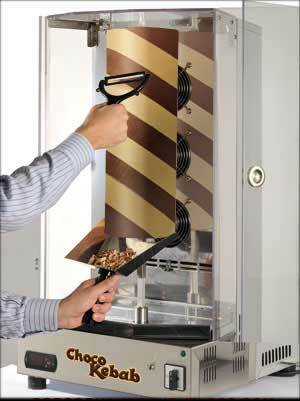 Both kids and adults alike will love the delicious chocolate shavings from our chocolate kebab machine. Our choco kebab maker machine would make a fantastic addition to your christmas party, summer party, wedding reception, birthday party, corporate event, fete or fair. Delicious chocolate shavings are cut from the rotating cooled chocolate. To create your perfect chocolate kebab. They fill a freshly made pitta crepe. Our chocolate kebab machine always includes a member of our staff to operate it, so that you can relax and enjoy your event. Our normal hire period is for 2 hours. Up to 100 chocolate kebabs are included. At the end of the event you don't have to worry about mess as we will clean up with care. 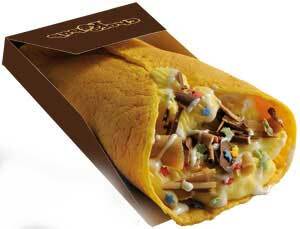 Additional ingredients can be added to your chocolate kebab, such as cream, marshmallows, hundreds and thousands, chocolate sauce, nuts and raisins. Please Phone or E-mail for more information or to check availability, all we need to know is where you are.